On Wednesday, September 19th from 2:30 to 3:30 p.m., the Policy Lab at ISPS will be hosting a talk with Alexander Heffner on “Civil Discourse in an Uncivil Age: The Quest for Post-Partisan Citizenship.” The talk will consider the effects of divisiveness on discourse and governance and the impact of social media, disinformation, and filter bubbles that polarize information intake. What are possible prescriptions to correct this vicious cycle? How can our footprint translate into pro-social instead of anti-social behavior? How can the press restore faith in civic life and the political process? This event is part of the Poynter Fellowship in Journalism, which brings talented journalists to campus to discuss issues of national importance. 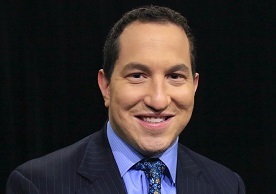 Alexander Heffner is the host of The Open Mind on PBS and coauthor of A Documentary History of the United States (Penguin, 2018). He has covered American politics, civic life and Millennials for leading newspapers and magazines. He founded and edited the first-ever online national student newspapers covering the 2008 presidential campaign and the Obama presidency. His work has been profiled in The Washington Post, The New York Times and The Los Angeles Times, and he has lectured at the Kinder Institute for Constitutional Democracy at the University of Missouri, the Post-Truth Initiative at the University of Sydney, and the Center for Information and Bubble Studies at the University of Copenhagen, among other institutions of learning. He directed a civic education initiative for which he taught in under-served classrooms and was the political director for WHRB 95.3 FM. A native New Yorker, he is a graduate of Phillips Academy in Andover, Massachusetts and Harvard.